Sofa One is yet another amazing design for people like me who want their furniture to multitask. 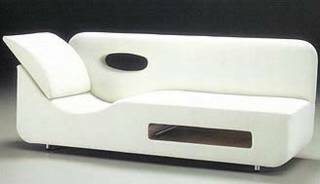 In fact, designer Karim Rashid created the sofa specifically so he could get more work done. Which is a good thing, because I’d like to see more designs by Rashid. 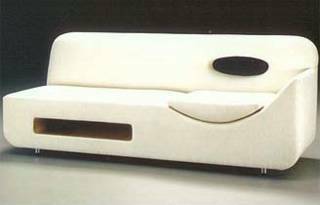 The most interesting thing about Sofa One is that it has a chunk carved out of it. You can use the chunk either as a leaning-against cushion if you want to lounge around or as a sitting-on cushion if you want to work. The chunk is also next to a cut-out bit in the back that will work as an arm rest when you're using the chunk in leaning-against mode (though it seems to have no benefit in sitting-on mode). Finally, there's another cut-out bit in the bottom of the couch for convenient storage. One of the more intriguing aspects of Sofa One is this note on the Robb Report site: "The piece…is available in Rashid's favorite furry white fabric." Do tell! And also tell us, Rashid, when we can expect to see Sofa Two. You can get Sofa One in either a right- or left-facing version, and in many many fabrics and colors. It starts at about $3,000 and goes up from there. Is the "chunk" hinged, or do you have to just position it and hope it sits nicely? $3000 !! I found this sofa in red about 6 months ago for $500 but didnt get it.. Wish I would have bid now. Is the cut-out in the back really in the right place to use as an arm-rest? It looks much to far forward (towards the center of the sofa). I can't envision that lying back against the cushion and sticking my elbow that far out would be comfortable. And on further contemplation, the arch in the back-rest looks too severe (unless it is very soft, at which point I become dubious about its ability to provide support in the "seating" configuration). Yes, it is "hinged". If you read the site he gives, there's this, "The cushion is attached for proper hinging." I enjoy your site even though my taste is much more traditional. I hope you do not find it a burden with so many eyes on it, but are enjoying what you do.